That does sound kind of magically delicious, though I'm typically not in favor of fruits on my non-fruity foods. Hi Helen! I'm going to Miami soon - where did you guys get these? Kate, this particular set of dogs is from Bijan's Burger Joint in Coral Gables, which was near our hotel and not terribly great. 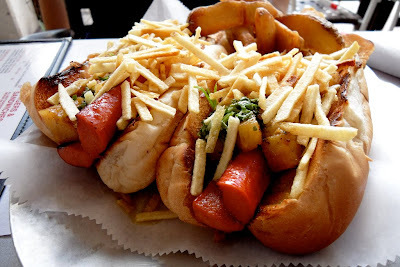 I'm sure there a billion and a half other (better) places to get a Columbian Hot Dog in Miami. Having looked at your flickr, I think your Miami trip was much more latin than mine. Well, Marcin, we were there for a Cuban wedding. But there were definite periods of Jewish Grandma, as well. Wow, they sure look delicious! No wonder your world will never be the same. Although, my taste are similar to Gray's, apart from the pineapple the hot dog looks scrumptious.